The Puckett Observatory is a private facility, owned and operated by amateur astronomer Tim Puckett. The observatory is located in the state of Georgia, United States. It is dedicated to the discovery of supernovae, and the study of comets. 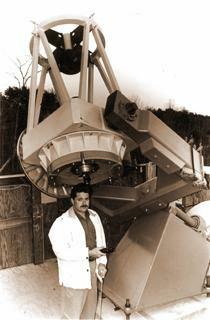 Tim is the sponsor and the primary investigator of the Puckett Observatory World Supernova Search. A team of dedicated amateur astronomers from around the world have discovered over 380 supernovae since 1994. You can contact Tim at 404.281-5686 or email tpuckett@mindspring.com. Type Iax Supernovae: A New Class of Stellar Explosion: This new class currently has 25 members, and the Puckett Observatory Supernova Search has discovered 7 of them: 2008ha, 2008ae, 2007J, 2006hn, 2005cc, 2003gq, 2002bp. Visit our Discovery page for more information.